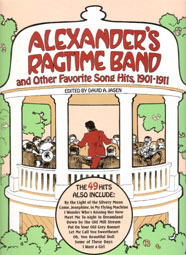 Sheet Music with lyrics for 36 hit songs of 1912 and 1913 . . . All are reprints of first or early editions of each song. Included are "Moonlight Bay", "Ballin' the Jack", "When Irish Eyes Are Smiling", "My Melancholy Baby", and many more. PUBLIC DOMAIN STATUS: The publisher states on the copyright page: "All the selections in this volume are in the Public Domain in the United States. They may be used in these original versions or adapted or modified and used for any purpose, private, public, educational, or commercial. No permission, fee, or royalty payment is required. The above does not apply in countries outside of the United States where copyright protection may exist."